To enter into the worlds of Czech surrealist Jan Svankmajer - onscreen or off - is to immerse oneself inside a singularly imaginative mind. 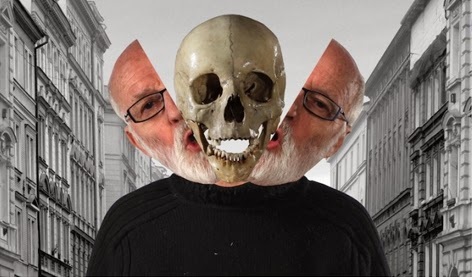 Whatever the medium involved – film, puppetry, sculpture, collage, poetry or animation – Svankmajer has amassed a body of work as deeply engaging as it is wildly eclectic. As noted in this month's print issue of Sight & Sound, the 2013 edition of Brighton Cine-City Film Festival will be screening a complete retrospective of Svankmajer's short films and six features, many of which will subsequently tour the country. 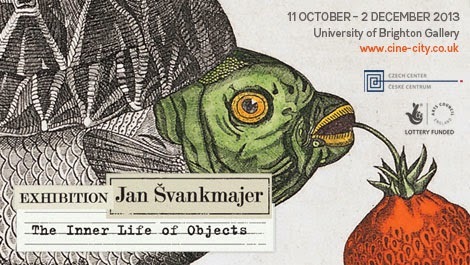 Alongside other special celebratory events, The University of Brighton Gallery is hosting the month long exhibition Jan Svankmajer: The Inner Life of Objects. Split into two sections – Natural History and Film – the exhibition encompasses three dimensional creations, posters, illustrations, puppets, film clips, sets and props that either act as a nostalgic treasure trove for those familiar with Svankmajer's work or as an enlightening entry point for those new to it. The Natural History (Historia Naturae) half of this compact but diverse exhibition captures the essence of the artist's work - alternately playful and disturbing, realistic yet fantastical, on the one hand evoking fairy-tales and on the other nightmares. Animal skulls and bones, feathers, watches, twigs, glass eyeballs, minerals and shells are just some of the materials Svankmajer has employed in the creation of a menagerie of fantasy creatures. Mostly skeletal in appearance, these fictitious beings feel familiar despite their obvious unreality, containing enough of a likeness to real species' to warrant their recognition as such. Wandering from cabinets of curiosity to the accompanying, richly detailed anatomical illustrations that line the gallery wall is to be educated in the ways of Svankmajer – his humour and childlike inquisitiveness, innate artistic talent and deep connection to worlds both real and imagined. There is a primitive, naïve quality to the assemblages that belies the skill of their creation, their lifelike quality forging a strong dialogue between Svankmajer's work in other mediums. He once said that 'I don't actually animate objects, I coerce their inner life out of them', and encountering these strange creatures goes a long way to affirming the statement. 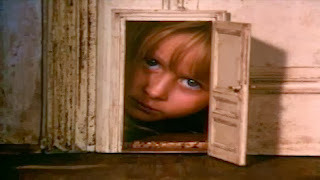 Viewing the collection of film related pieces that make up the second part of The Inner Life of Objects is a no less tangible experience, for while numerous monitor screens show selected clips from Svankmajer's shorts and features, the space is dominated by many of the creations seen in those films. If the Natural History pieces are the, literal, bare bones of Svankmajer's imagination, the Film pieces are the meat on them. Little Otik is present, complete with the assortment of extra pieces used to animate the tree stump-baby, the mouse from Alice (1988) is to be found sat atop a wig, and a quite beautiful set from the same film – featuring a combination of puppets and cardboard cut outs – draws the eyes into its magical tableaux. Dominating the space, however, is a frankly terrifying crucified figure, hung high on one wall. A prop seen in Svankmajer's Lunacy (2005), the form is, justifiably, horrific. Nails protrude from almost every part of this tragic, sacrificial victim – the humour seen in much of the rest of the collection is decidedly absent in this depiction of an already brutal form of execution. The crucified figure is an unmissable reminder that while Svankmajer's work is often playful it is also as embracing of the repulsive. That the repulsion comes from the depiction, however exaggerated, of human cruelty and the playfulness comes in the shape of the bizarre creatures drawn from Svankmajer's own imagination says much about the man, his work and his worldview.